Probability is important but probability without understanding risk-reward ratio means nothing because together they constitute your edge. For instance there is no point having a strategy that wins 95% and results in a profit of $10 or a loss of $1000. Why? Because if you make 100 trades then even though hypothetically 95 of them could be winners 95 X 10 = $950, losing just 5 trades would result in losses of $5000 and an overall net loss position of $4050. This is why its not so much about how often you are right in terms of your trades but more important in understanding what is the relationship of the risk-reward ratio to your probability of success and ensuring you have a positive expectancy (known as an edge). When I started out looking to develop a trading strategy I started out with about 10-12 hypotheses based on a theoretical understanding of how I believe the markets of interest would react given certain circumstances in a football match. I had to identify particular variables which I felt were important in contributing or preventing the market validating the hypotheses. This allowed me to then generate a percentage as to how many times I was wrong vs how many times I was right in terms of my hypothesis about how market would react with specific scenarios from the past. I also would have needed to have known what were the market prices at the times I would have taken the trades and what would have been my exit point from the trade as this would enable me to determine what my risk would have been and what my profit margin would have been. So using a combination of probability of successful trade and understanding what my risk-reward ratio was I then was able to conclude that after back testing over 100 trades for each hypothesis, 9 of the hypotheses were unprofitable and 3 were profitable. For the 3 that were left I then went to work in running another simulation of 100 trades and then another until I had data from over 500 trades. If they still remained profitable over the 500 trades then I knew I had something. After a further 500 trades only 1 hypothesis remained profitable. Now it was time for optimization and seeing if there were any additional filters I needed to apply to help streamline the process and net profitability, whilst not being sucked into what is known as curve fitting. Optimization could be based on other factors such as did I notice that my strategy had a higher percentage of wins when I focused on football matches in specific countries. For instance there are countries which have a historical reputation for not scoring lots of goals like Belarus whereas there are other leagues like in Holland where they are known for playing an attacking brand of football. Armed with such external information could then help me to make decisions that helped in the optimization process. Once I was happy with the back testing performance the next stage was to trade using a demo account and run this strategy for 500 trades. If the results at a minimum affirmed the same level of performance from the back test then it was a positive sign to continue so the next step would be to test it in a live environment using very small stakes. Once I was able to demonstrate that the strategy worked in a live environment with small stakes then this would mean I now had the confidence to scale up my position size. This is a high level overview of how I look to identify an edge. Obviously there is a lot more detail which goes into the realms of statistical analysis, standard deviations and different measures of volatility but I am trying to keep this very high level. Edge simply means a strategy that gives you a higher probability of creating net profit over the long term rather than having net loss. 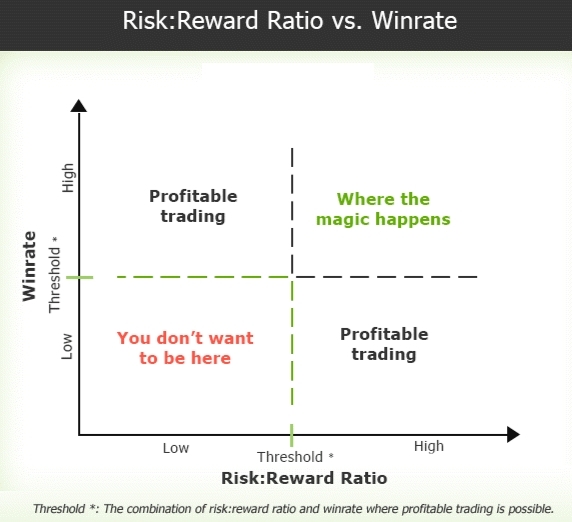 Its not just about the percentage of wins but also about the percentage of wins coupled with your risk reward ratio. This is something which works well especially if you are working with a strategic model that employs defined risk. Its all about coming up with a number of assumptions or hypotheses about the market you are in and then using data analysis to either prove or disapprove your assertions. But it does take time. The back testing process took me about 3-4 months, the demo account took me 1 month and the small position sizing stage took another 2 months before I was ready to ramp up my position sizing. This means that unless you are someone who has access to simulations that can run thousands of back testing trades in a short space of time, the process of finding an edge could be a lengthy one. But its worth the experience compared to trying someone else's strategy because there is more fulfilment creating something from your own intuition. Now that we have got the basics out of the way in regards to identifying an edge here is a very important component for your consideration. My primary trading strategy is built on what is called 3R. This means the ratio of reward to risk is as close to 3:1 as possible so I seek trading opportunities where my profit is three times the size of my liability. In seeking these opportunities my weekly win rate averages around 43% and I normally place around 30-35 trades per week. Notice that experienced forex traders like Charlie Burton trade with a win rate of 50-60% and a risk-reward where their winning trades are at least twice the size of their losing trades. Many of the world's best trend following systems in financial markets have win rates of less than 40% yet make considerable profits. There is something about trading counter-intuitive (going against the need for an excessively high win rate) which seems to reward you much better over time providing you have the right psychology to embrace it. Ultimately you neither need an extremely high win rate nor a large reward risk ratio to make money as a trader. As long as your reward risk ratio and your historical win rate match, your trading will provide a positive expectancy. This is why you have to test things out for yourself to find the right balance between win rate and risk reward ratio because this is the building block of your edge. In conclusion, your trading edge is your bedrock. It is the granite that holds your trading strategy together in adverse conditions when the market gods of destruction seek to shake the exchange you are trading on so that those who have no firm foundation drop off like rain falling from the sky. You cannot be a successful trader without an edge. If you have no edge then I am unsure as to how long you can survive. When you know your edge then trading becomes like a board game. Its all about the numbers. You no longer have to worry about losses because you know its about profiting over a series of trades as opposed to getting emotionally sabotaged by single individual trades. Finally, its important to realize that you need to trade with enough frequency for your probabilities to play out and this becomes clear when you understand the law of occurrences (large numbers) and the law of streaks.